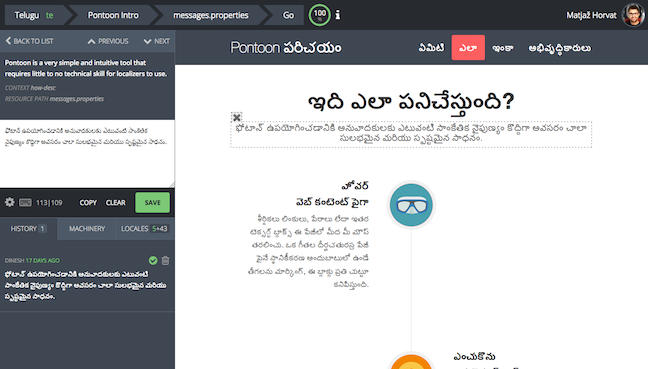 We’re improving the way in-page localization works in Pontoon by droping a feature instead of introducing a new one. Translating text on the web page itself using the contentEditable attribute has been turned off. That means the actual translation (typing) always takes place in the translation editor, which gives you access to all the relevant information you need for the translation. The sidebar is always visible, allowing you to select strings from the list and then translate them. Additionally, you can still use the Inspector-like tool to select any localizable string on the page, which will then open in the translation editor in the sidebar to be translated. It’s hard to control markup or new lines on various sites if they’re part of the string. I like this change. There is one issue that I thought this change would address. But, turned out the issue is with the markup not Pontoon it self.